Designed for safety directors, human resource professionals, project managers and risk managers, the National Electrical Contractors Association‘s Safety Professionals Conference is the electrical construction industry’s premier annual safety event. Attendees learn the most up-to-date information on regulation, compliance, management techniques and standards development – issues that impact safety and health in the electrical construction industry on a regular basis. To promote the 2014 conference, NECA partnered with Matrix Group on a redesign of the site. 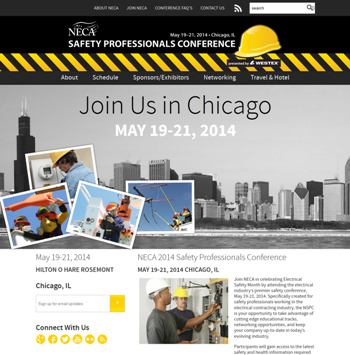 Matrix created a design inspired by the conference’s safety theme and location in Chicago. The site was re-implemented in WordPress, making it easy for NECA staff to update it with the most up-to-date conference information. Visit the website at www.necasafetyconference.com.